You may have a TriBand or QuadBand filter without knowing it. So you want to try a triband or quad band filter but the dollars stop you. Well you may be in luck. Overtime I looked at the spectral graphs of these expensive filters and I thought maybe I can combine two filters to produce a similar response. Well as luck has it I had just what i needed. 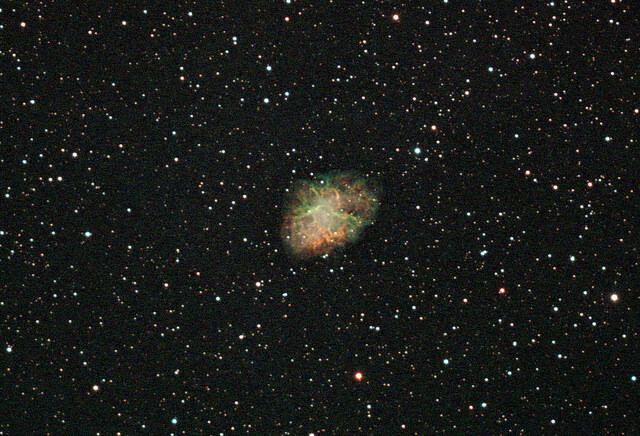 So I took an Astronomik UHC and stacked an Astronomik IR Block and ended up with a quad band equivalent. 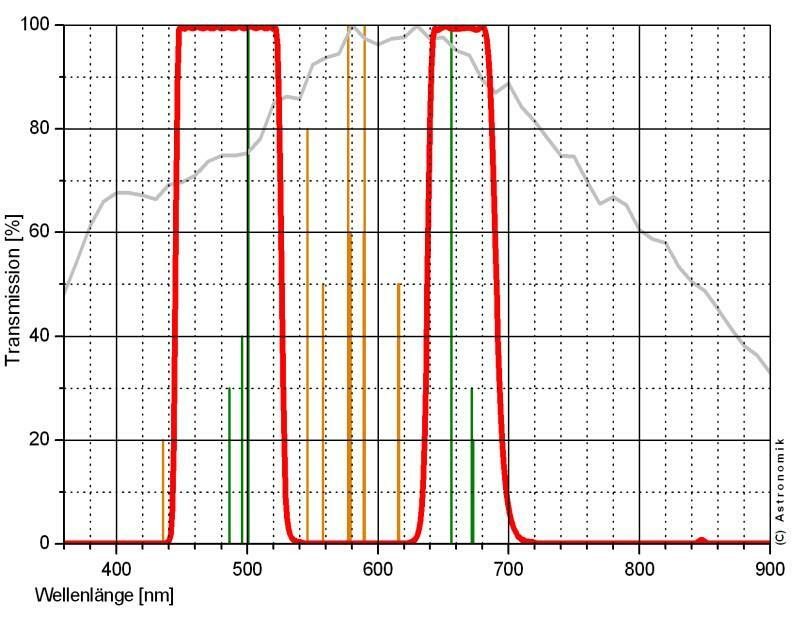 This UHC filter has a passband of 480nm>506nm and 640nm>and beyond. 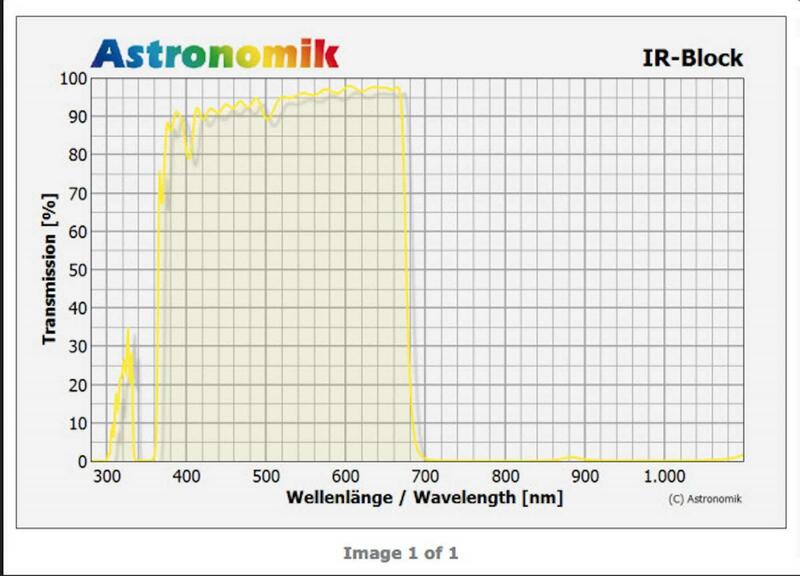 The Astronomik IR Block has a passband of 370nm>688nm. Stacking them together I ended up with two passbands of 480nm>506nm (Hb+Oiii) & 640nm>688nm (Ha+Sii) thus yielding a quadband filter combo. 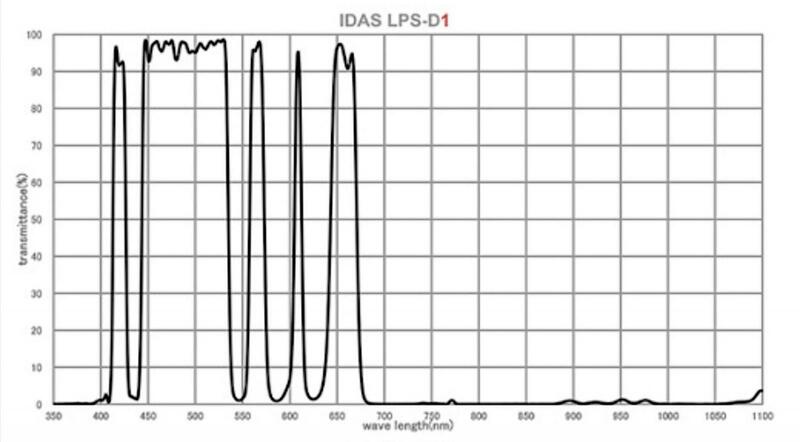 I also tried my Idas LPS D1 with the Astronomik UHC and got similar results with the Sii region possibly being suppressed. Instead of a cut off of 688nm with the IR Block the D1 gave a 673nm cutoff. 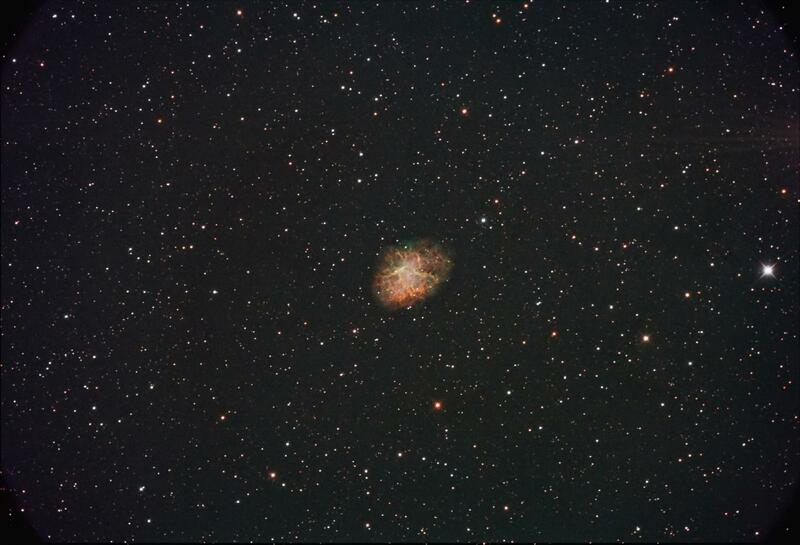 I noticed a little more red when using the IR filter, but not that much to make much of a difference. 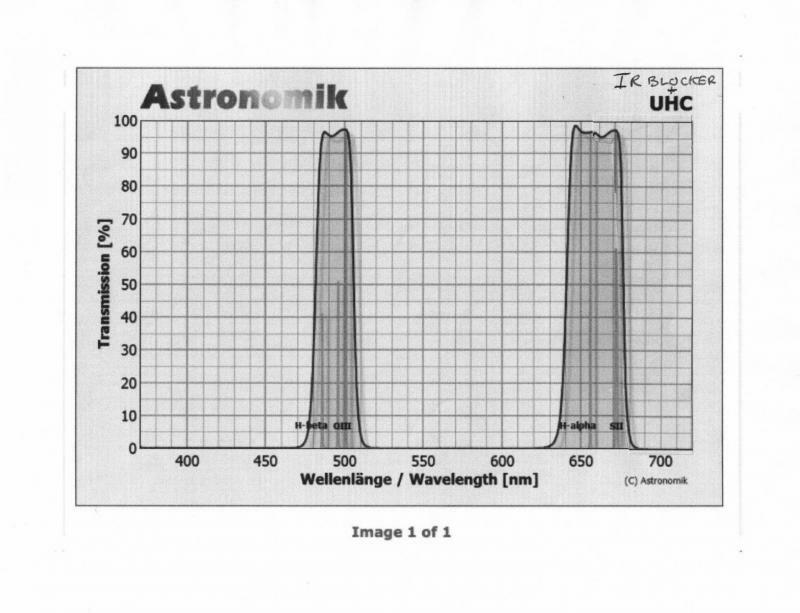 Off course these wavelength are approximate and will be slightly different for your optical setup due to incoming angle of the image presented to the filters. These filter combos may not provide the same passbands as the expensive dedicated filters but they sure provide a lot of fun for no additional cost. Edited by DonBoy, 20 January 2019 - 06:59 PM. Here are some images taken using the above filter combinations. I like the results of your filter combination and you are to be commended for thinking out of the box. The crab nebula looks really nice- do you have a bigger image you could post? I wish the weather was better- nothing but cloud & rain for the last month and a few more weeks of the same forecast. The good point is that it is giving me a chance to correct a number of pressing issues that has stopped my observing since October of last year. Edited by DonBoy, 20 January 2019 - 05:19 PM. Hmmmm...VERY Interesting!! !.....I need to look at my Baader filters to see how they may work with my ASI-1600MC-Cool..
Nice "Thinking outside the box"
Edited by CCD-Freak, 20 January 2019 - 06:16 PM. Is IR-Block and IR-Cut the same ? Don, nice job. What kind of skies do you image from? Yes they are. You would want an IR blocker or IR cut to cutoff at around 675nm to 685nm. Those that cut off or block at 700nm will still work but will cause a wider passband and thus more emphasis on the red. Edited by DonBoy, 21 January 2019 - 11:58 AM. Thanks elmiko. I'm in a Red Zone Bortle 6. And strictly image live while on NightSkiesNetwork.com. The key to the new filters is how they have narrow band passes for all 4 or 3 emissions lines. This is what drives the price up and its the novelty of the filter. Any other combination and you are letting more LP in. Edited by RogeZ, 21 January 2019 - 11:57 AM. Coolness! The UHC and IR block look like a very interesting combination. Agreed Roger, how narrow the passbands are is directly related to it's effectiveness and it's cost. 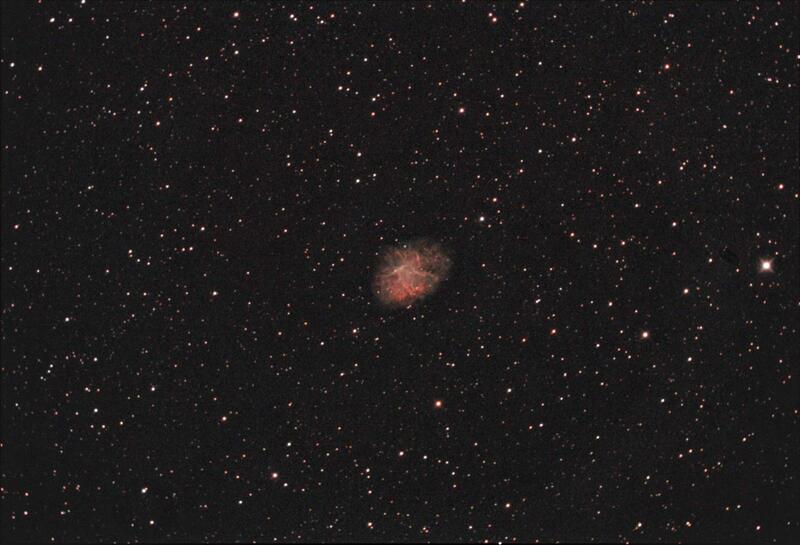 But experimenting with these two filters has brought a whole new method of dealing with LP and the Moon. And additionally yielding images with a different twist and revealing colors I would not have normally seen. It's been a lot of fun using this combo and I would like to try the more narrow band filters but they are more than I care to spend. 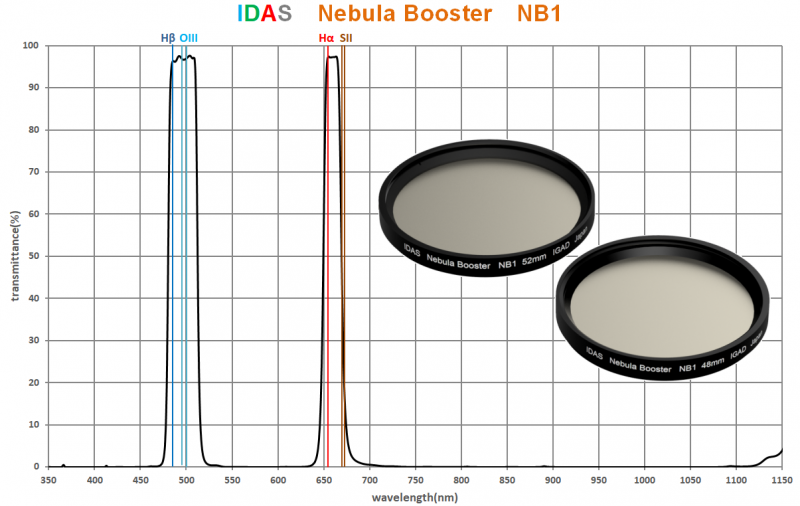 An interesting new filter that may prove to be an economy narrow band filter is the Idas NB1. Reflecting on Roger's comments about narrowness of passbands. 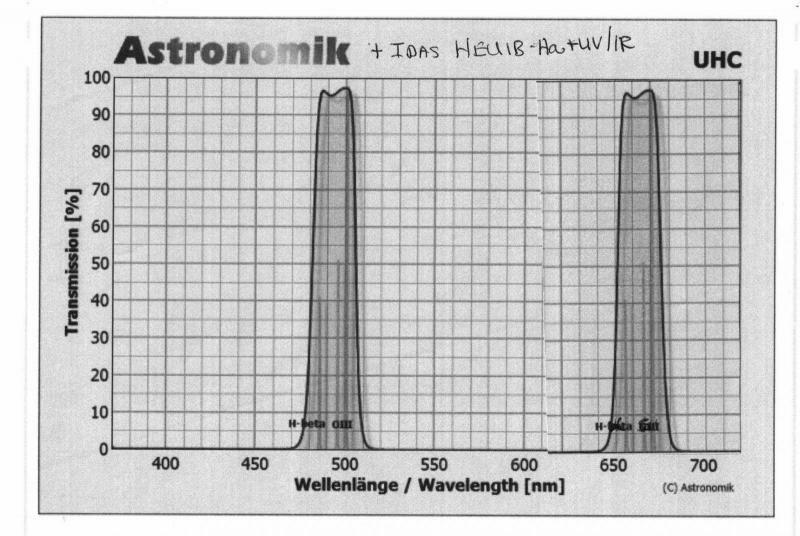 If one had a Hutech HEUIB II filter then one could narrow the Ha+Sii passband by quite a lot as compared to stacking the Astronomik UHC with the Astronomik IR Blocker. Edited by DonBoy, 21 January 2019 - 12:31 PM. I have been looking at the NB-1. It is not too costly so I may try to get one. I absolute love experimenting, nothing wrong with it. The Triad and Triad Ultra are as costly as they are because of the narrow bandpass they offer. No other filter can claim such narrow band passes and you can get the same performance with these. Also, I dont know how much you actually gain by stacking filters, given the loss of transmission and the inherent chance of reflections creeping in. 4nm and 5nm are also expensive by themselves. My Astronomik 50mm Round, 6nm H-alpha cost me $480. My 3nm H-a Chroma cost me $750. I think this new breed of filters are a great value at $1100. For now I'm using the STC Duo Narrowband but next month I will order the Triad Ultra. This is a good low cost choice. If I didn't have the filters I used I would probably have gotten one of these to experiment with. Hi Alex, sorry I missed this question. I used the IR blocker to help narrow down the Ha+Sii bandpass. 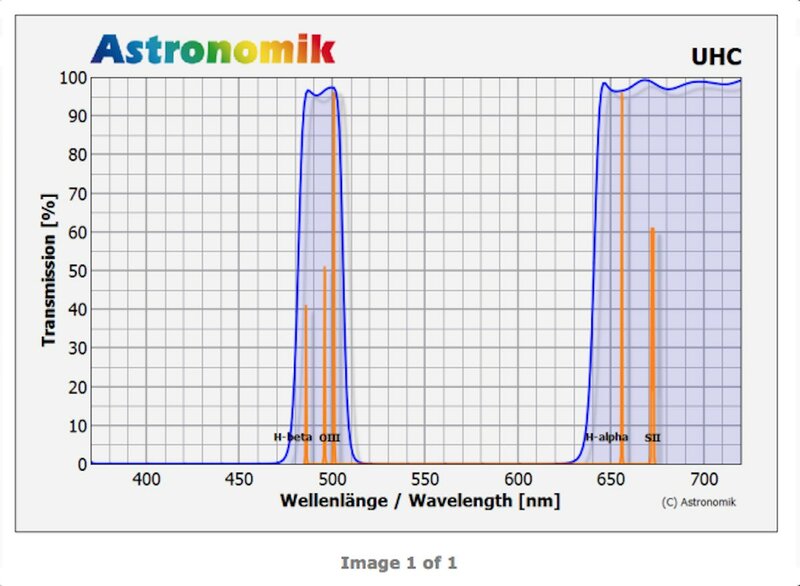 The Astronomik UHC is configured so that the upper bandpass starts at 640nm and continues to some very high value. The IR blocker cuts the UHC's bandpass at 680nm. By doing this there is less emphasis in the red spectrum and more of the Hb+Oiii will come thru. The IR blocker doesn't affect the UHC's bandpass of Hb+Oiii. 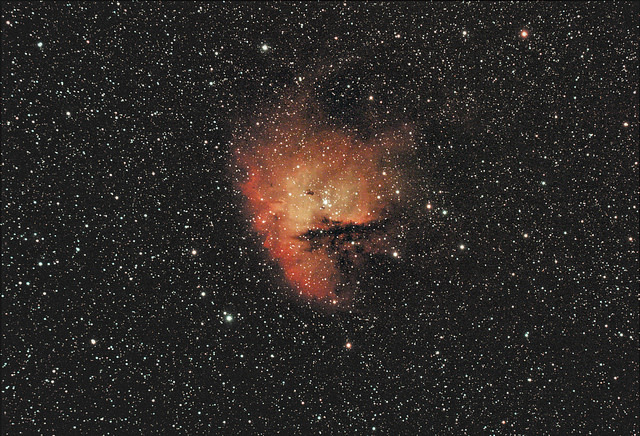 In my experimentation with these two filters I found that the IR blocker needed to be first in the optical chain (closest to telescope) and then the UHC otherwise the images are much more red biased; which is not what I was after. I was looking for a way to get the image results that separate Ha and Oiii filters can yield when combined. 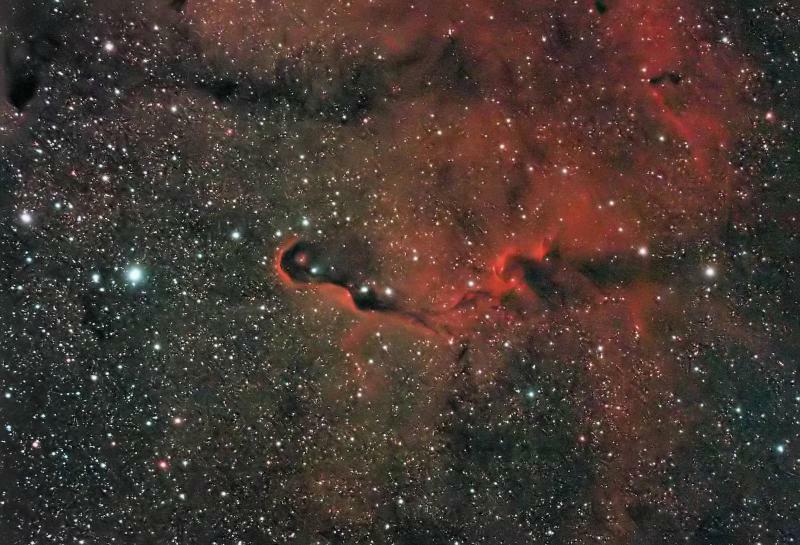 I think I have and also I have gained the benefit of a stronger LP filter which also helps when imaging when the Moon. Edited by DonBoy, 26 January 2019 - 03:10 PM. Thanks for clarifying the order makes a difference. I just ordered the ZWO IR blocker to stack with my other filters. Going to try IR and NPB and see what that does. So these are filters just stacked one on top of the other while using a single-shot color camera? Yes with the UHC filter closest to sensor and an IR block screwed into the UHC or placed further upstream. 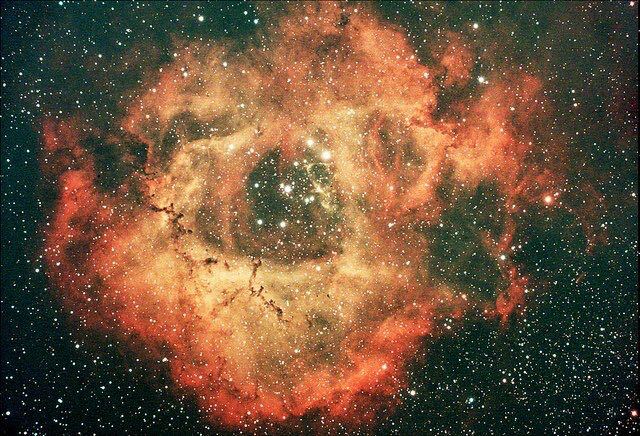 can I be lazy and you send me links to the filters that got you that crab nebula? that is amazing. 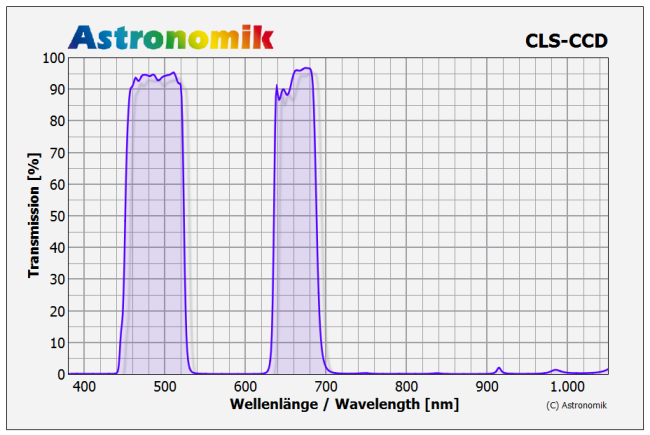 I have the Astronmik CLS-CCD filter and it cuts off IR at about 700nm and covers all the desired bands but just not as narrow. Edited by CCD-Freak, 28 January 2019 - 04:39 PM.